This recipe is so delicious. It's hopefully as close to my grandmother’s that I can remember. Delicately flavoured with vanilla and nutmeg, this makes for a creamy pudding with a rich golden skin! Preheat your oven 300'F /150'C / Gas 2. Lightly grease a 2-litre baking dish. 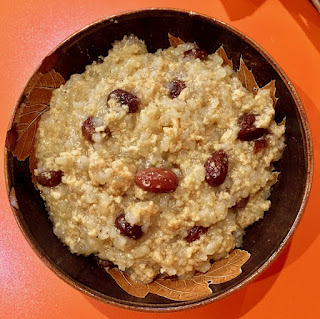 In a bowl, beat the eggs and milk together, then stir in the dairy-free spread, sugar, pudding rice, vanilla extract, raisins and ground nutmeg. Pour the mixture into your baking dish and bake for 2 - 2 1/4 hours. Stir 2-3 times during the first half of baking.